Why do we use pistols? To make us safe during the time of danger, right? But when we are at home or office, we need to store the guns from our kids or unauthorized person. From that’s where the concept of a safe has come. While buying a gun safe, there are many things to be considered. Recently, most of the users prefer a biometric gun safe because of user-friendliness. 1 Why should you buy it or not? -You can open the safe in three ways. If any of these options are not available to you for a particular amount of time, you can try another one. -Firstly, with a biometric fingerprint within a moment. You just need to press the key or touch the sensor to wake it up from the sleep mode. Then again touch the sensor. It’ll be opened! -Secondly, you can use a numeric combination to unlock. It has a backlit electronic keypad. These buttons are not so brightly which may create a disturbance of your night vision. -Thirdly, you will receive a pair of keys to open the safe. But, biometric entry is the quickest and safest method to get the hands on your gun in the face of danger. – Its door is pry-resistant and made of solid sustainable steel. The final finishing work of the steel is very professional and smooth. Hence, it gets an aesthetic look. -The safe does not use any rubber plastic keypad that can easily be pulled up after long-term usage. – You can access the safe with just a single hand. In danger, you can open the door of the safe with just one hand within just a second and make a phone call with another hand. 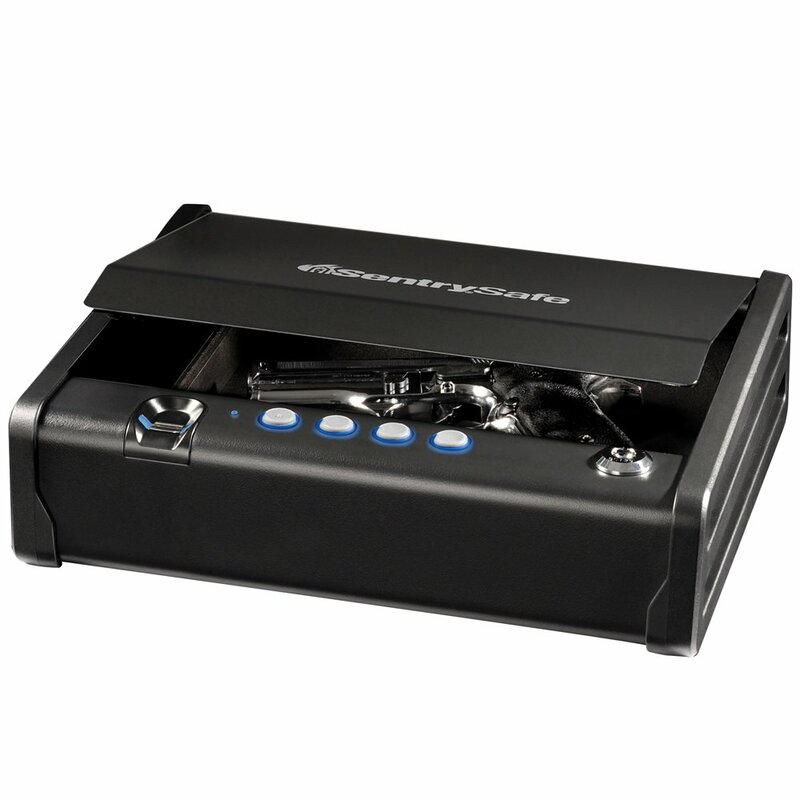 – This safe is powered with whisper quiet hardware. Compression gas strut controls the noise at the time of opening the lid. – It will be silent while operating. You will not hear any sounds of levers moving or the clicking sound of the lock which makes it premium. Isn’t it great? – You will get a user manual with the purchase which is easy to follow. You receive a one-year limited warranty as such you can repair, replace or be refunded in case any problem happens. – The safe has got factory pre-drilled holes at the bottom by which you can mount it to your required position the floor or a drawer. -The soft interior lining is another prominent feature which will make sure your sophisticated valuables are safe from scratches. – The reset button is hidden inside the battery compartment. It is used to put new place new code. – Just so you know, Department of Justice California has certified for firearm storage and protection. This QAP1BE? has a feature of using four fingerprints. So that, you can register your own fingerprints or your relatives whom you trust. You are good to go with extra security because manufacturers use triple lock system in here. The keypad response is as fast as the light. This safe is built with 12 gauge heavy and durable steel in which no one can break into it. The opening function of the safe is really calm and quiet. It assures you that the programming digital keypad is being operated with an almost zero audible feedback. It does not have the A/C power adaptor. You can overcome this problem by storing some backup batteries in case of emergency. The most attractive feature is the fingerprint scanner. It opens up within a moment. Now, come to the point of spending money for a safe. I will say- this safe is much more economical when it comes to a comparison among the similar sorts of a model like the GunVault SV500. Moreover, the built quality is great. After a wise consideration, anyone will suggest you buy it without having any hesitation and so will I.
I tried to make this Sentry Safe QAP1BE review as unbiased as possible. This gun safe has accommodated only one flaw so far of not possessing an A/C power adaptor. It’s not that big deal while you have the opportunity to have some batteries back up. Just look at the bright side of the coin. 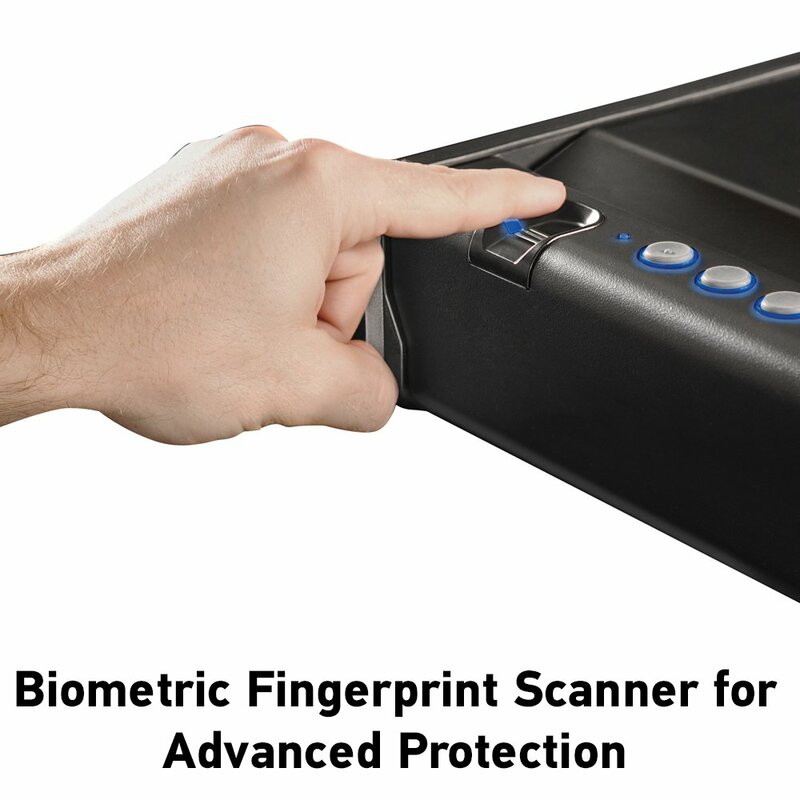 You are getting a superfast biometric fingerprint safe and solid steel made safe by spending only a few bucks and from the very highly recommended company, SentrySafe. It’s worth having an adventure! Stack-On PDS-1500 Review: Drawer Safe with Electronic Lock. Pingback: GunVault SV500 review - the SpeedVault Handgun Safe.